"Aerial view of Firey Creek showing the outline of the Challicum Bunyip," from an article by A. Massola, ‘The Challicum Bun–yip’, in The Victorian Naturalist, vol. 74, no. 6, 1957: 76–83. 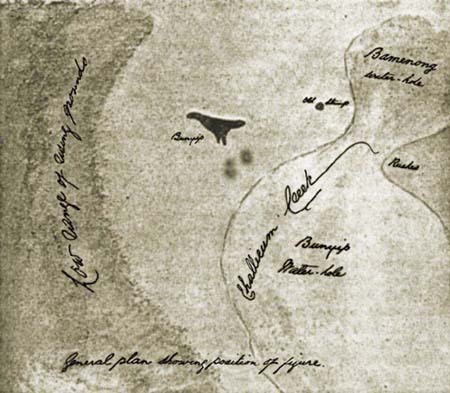 In addition, Massola's article provided this illustration of the outline of the 'Bunyip.' Both the map and illustration were created ca. 1867 by E. W. Scott. This copy of the images comes from the National Library of Australia website (archived in Pandora) [Link Here].